The patient is a 19-year-old male who presented to the ophthalmology clinic at UIHC for 1 month follow-up of newly diagnosed acute promyelocytic leukemia (APL) with leukemic retinopathy in the left eye. He was initially diagnosed with APL 1 month prior and started on all-trans-retinoic acid (ATRA) and Idarubicin (anthracycline chemotherapy) induction therapy. One day after diagnosis, he was seen in the ophthalmology clinic at UIHC because of decreased vision in the left eye that he had noted for several days before the diagnosis of APL. He was found to have a large preretinal macular hemorrhage in the left eye, presumed to be due to profound thrombocytopenia and disseminated intravascular coagulation secondary to the underlying APL (Figure 1). The optic nerves were unremarkable at this examination. He did not have a history of trauma. For one week prior to follow-up, he was having intermittent headaches and transient visual obscurations. He also noticed a pulsatile intracranial sensation, but no pulsatile tinnitus. Of note, on the day of follow-up, he was on day 41 of the 45-day course of ATRA-induction therapy and had already completed idarubicin induction therapy. Medications: ATRA (day 41 of 45 induction therapy). Recently completed Idarubicin (anthracycline chemotherapy) course of induction therapy. Acyclovir for HSV prophylaxis. Family History: Aunt with lymphoma. Grandmother died from an unspecified type of cancer. There was grade III optic disc edema OU with possible grade IV disc edema OD. There were also retinal nerve fiber layer hemorrhages radiating from the discs (Figure 2). The macula of the left eye had preretinal hemorrhage over the fovea and extending inferonasally toward the inferotemporal arcades. There were exudates superotemporal to the fovea. Optical coherence topography demonstrated marked thickening of the peripapillary retinal nerve fiber layer OU (Figure 3). GVFs revealed enlarged blind spots and a central scotoma in the left eye (Figure 4). Acute promyelocytic leukemia (APL) is a relatively rare form of acute myelogenous leukemia (AML) accounting for 5-15% of cases of AML (Ribeiro, 2006). The average age of onset is 40 years old, but APL can also be seen in the pediatric population. APL is caused by a balanced reciprocal translocation between chromosome 17 and chromosome 15, t(15;17)(q22;q21), which results in the fusion of the α-retinoic acid receptor gene on chromosome 17 to the PML gene on chromosome 15 (Diverio et al., 1995). This abnormal PML/RAR α fusion protein leads to APL by blocking the retinoic acid-mediated differentiation in myeloid cell lines, leading to arrest of leukocyte differentiation at the promyelocyte stage. APL often presents clinically with hemorrhagic diathesis and coagulopathy, and can present with retinal hemorrhages due to profound anemia and thrombocytopenia. The treatment for APL has been revolutionized with the use of all-trans-retinoic acid (ATRA). ATRA is able to differentiate promyelocytes into mature granulocytes in patients with APL (Elliott et al., 1992). ATRA is highly effective in inducing remission in patients with APL, with rates of remission from 80-94% (Huang et al., 1988; Selleri et al., 1996). ATRA is often started immediately in patients diagnosed with APL to control coagulopathy, even before the diagnosis is confirmed by genetic testing. The dosing for ATRA therapy was traditionally 45 mg/m2 per day divided twice a day, but may be effective at a lower dose of 25 mg/m2 per day in pediatric patients (de Botton et al., 2004; Ortega et al., 2005; Testi et al., 2005). The lowest effective dose is desirable because of the potential side effects, including retinoic acid syndrome and ATRA-associated intracranial hypertension. Retinoic acid syndrome can present within the first 21 days of therapy and is characterized by fever, hypotension, respiratory distress, acute renal failure, hepatic dysfunction, cerebral infarction, and myocardial infarction. Treatment with dexamethasone at 10mg twice a day should be started at the earliest sign (Sanz et al., 2009). Intracranial hypertension secondary to ATRA was initially documented in 5 of 9 pediatric patients treated with ATRA at 45 mg/m2 per day (Mahmoud et al., 1993). It has since been the subject of many case reports, predominantly in pediatric patients receiving an ATRA dose of 45 mg/m2 per day or more, but also occasionally in young adults (Colucciello, 2003; Naderi et al., 1999; Yeh et al., 2006). As in idiopathic intracranial hypertension, these patients have signs and symptoms of intracranial hypertension, including headache, pulsatile tinnitus, transient visual obscurations, ophthalmoplegia, and occasionally visual loss, but have no other identified cause for intracranial hypertension (Corbett and Mehta, 1983). The diagnosis is supported by an elevated opening pressure of >250 mm H20 during lumbar puncture (see IIH eyerounds by Dr. Pham and Dr. Wall). Intracranial hypertension associated with ATRA usually presents between 3 to 17 days after onset of ATRA therapy, but there have been case reports of patients developing symptoms 6 months after onset of ATRA therapy (Mahmoud et al., 1993; Yeh et al., 2006). The exact frequency of ATRA-induced intracranial hypertension is not known because the majority of instances are reported in small case reports, but recent larger studies suggest that approximately 10% of pediatric patients undergoing ATRA induction may develop intracranial hypertension. In a recent study with ATRA induction at 45mg/m2 per day for APL, 5 of 31 children developed signs and symptoms compatible with intracranial hypertension, which improved when reducing the dose to 25mg/m2 per day (de Botton et al., 2004). Testi and colleagues noted intracranial hypertension in 10 of 107 pediatric patients treated with ATRA at a dose of 25mg/m2 per day (Testi et al., 2005). The pathophysiology of ATRA-induced intracranial hypertension is unknown, but is likely related to intracranial hypertension due to vitamin A toxicity. Hypervitaminosis A associated with intracranial hypertension was first described by Gerber and colleagues in 1954 and is now a well described association (Gerber et al., 1954; Libien and Blaner, 2007). Other forms of vitamin A, such as isotretinoin (Accutane) have also been found to be associated with intracranial hypertension (Fraunfelder et al., 2004; Roytman et al., 1988). Interestingly, recent studies have found increased levels of unbound retinol in the cerebrospinal fluid (CSF) of patients with idiopathic intracranial hypertension that did not receive vitamin A supplementation (Tabassi et al., 2005; Warner et al., 2007). It has been suggested that forms of vitamin A, such as ATRA, may cause overstimulation of RAR α receptors in the central nervous system, resulting in increased intracranial pressure by impairing CSF absorption (Visani et al., 1996a; Visani et al., 1996b). It has been speculated that an age-related decrease in these receptors may contribute to the higher incidence of ATRA-induced intracranial hypertension in the pediatric population (Visani et al., 1996b). While intracranial hypertension should be high on the differential for any patient that develops headache while undergoing ATRA therapy for APL, other etiologies include ATRA-induced headache without intracranial hypertension, intracranial hemorrhage, leukemic involvement of the meninges, and bacterial/infectious meningitis. 10-20% of pediatric patients undergoing ATRA therapy develop severe headache without evidence of intracranial hypertension (de Botton et al., 2004; Testi et al., 2005). Patients with ATRA-induced intracranial hypertension must also be differentiated from patients with infiltrative optic neuropathy with meningeal involvement causing intracranial hypertension. However, these patients will often present with unilateral optic nerve involvement, decreased vision, RAPD, and poor color vision (Guirgis and Lueder, 2003). Patients with APL are coagulopathic and at risk for intracranial hemorrhage. Lastly, these patients are immunocompromised and are susceptible to opportunistic meningitides, which can also present with headache and optic disc edema. In patients that develop ATRA-induced intracranial hypertension, cessation of ATRA treatment or halving the dosage usually leads to the resolution of intracranial hypertension within 1-2 months, including resolution of headache and disc edema (Colucciello, 2003; Yeh et al., 2006). In some patients that develop intracranial hypertension early in the course of ATRA therapy, symptoms of intracranial hypertension, including optic disc edema and headache, can be managed with acetazolamide to allow continued ATRA therapy (Guirgis and Lueder, 2003; Machner et al., 2008). In addition, repeat lumbar punctures have been used to manage the symptoms of intracranial hypertension during continued ATRA therapy until induction of marrow remission (Decaudin et al., 1997; Naderi et al., 1999). Diagnosis: ATRA-induced intracranial hypertension in the setting of APL. In addition, he had preretinal macular hemorrhage in the left eye due to profound thrombocytopenia and disseminated intravascular coagulation associated with APL. Our patient was already on day 41 of a 45-day course of ATRA-induction therapy, with a recent bone marrow biopsy showing excellent response to ATRA. The patient had headache and enlarged blind spots, but no other visual compromise. Therefore, the decision was to stop ATRA without the need for therapeutic lumbar puncture or acetazolamide. On one week follow-up, the disc edema had mildly improved. 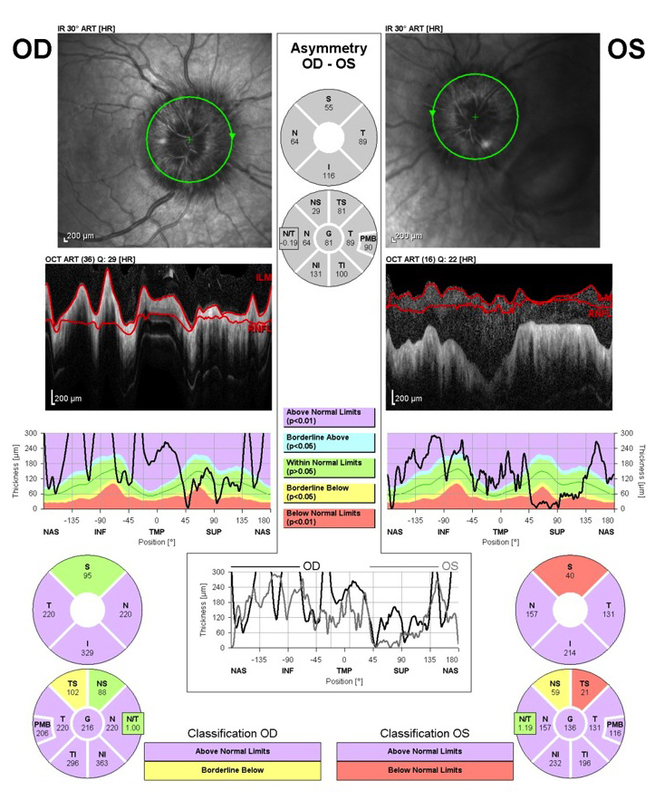 Subsequent evaluation at 2.5 weeks demonstrated marked improvement, with grade 1 optic disc edema and no symptoms of intracranial hypertension (Figure 5). After testing revealed complete morphologic, cytogenetic, and molecular remission of the APL, he was started on consolidation therapy, which includes short cycles of arsenic chemotherapy with ATRA. After his first 2 week cycle of consolidation therapy, he had a recurrence of headache and worsening of the disc edema to grade 2. After stopping the ATRA, the symptoms again resolved. Because the patient will be required to be on intermittent ATRA therapy for the next two to three years during consolidation and maintenance therapy for APL, it was decided to administer oral acetazolamide, 500 mg bid, during the next cycle of ATRA therapy. The most recent follow-up after his second round of consolidation therapy consisting of arsenic and ATRA plus prophylactic acetazolamide revealed no disc edema and the patient had no symptoms of pulsatile tinnitus or headache. In addition, the preretinal hemorrhage in his left eye has continued to improve. His most recent VA was 20/20 OD, 20/30 OS with a residual 0.3 log RAPD OS. We plan to administer prophylactic oral acetazolamide in conjunction with all future ATRA therapy. Differential Diagnosis: intracranial hemorrhage, ATRA-induced headache, optic nerve infiltration by APL, meningeal leukemic infiltration, solid tumor, bacterial/infectious meningitis. Epidemiology: APL accounts for 5-15% of AML. In the US, there is an annual incidence of 1000 cases. The average age of APL at diagnosis is 40 years. The frequency of ATRA-induced idiopathic intracranial hypertension is around 10% in the pediatric population and is rarer in adults. Signs: Bilateral optic disc edema. 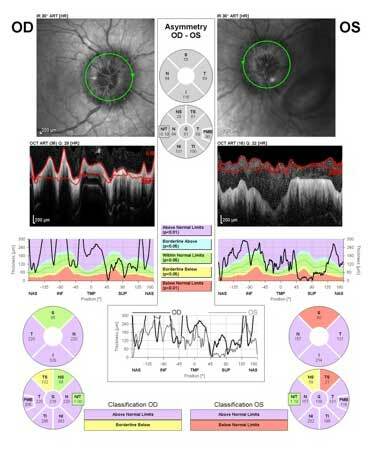 Visual field defects, including enlarged blind spot, nasal nerve fiber bundle and arcuate defects, and generalized constriction. Unilateral or bilateral sixth nerve palsies. Increased opening pressure on lumbar puncture (>250 mmH20). No signs of a mass, meningeal process, or venous sinus thrombosis on neuro-imaging, although there may be signs suggesting raised intracranial pressure, such as empty sella, optic nerve sheath unfolding, and transverse venous sinus stenosis. Treatment: Cessation or dosage reduction of ATRA. If ATRA needs to be continued, acetazolamide can be used to treat the symptoms of intracranial hypertension. Some patients can be treated with symptomatic lumbar punctures until induction of marrow remission. Colucciello, M. (2003). Pseudotumor cerebri induced by all-trans retinoic acid treatment of acute promyelocytic leukemia. Arch Ophthalmol 121, 1064-1065. Corbett, J.J., and Mehta, M.P. (1983). Cerebrospinal fluid pressure in normal obese subjects and patients with pseudotumor cerebri. Neurology 33, 1386-1388.
de Botton, S., Coiteux, V., Chevret, S., Rayon, C., Vilmer, E., Sanz, M., de La Serna, J., Philippe, N., Baruchel, A., Leverger, G., et al.(2004). Outcome of childhood acute promyelocytic leukemia with all-trans-retinoic acid and chemotherapy. J Clin Oncol 22, 1404-1412. Decaudin, D., Adams, D., Naccache, P., Castagna, L., and Munck, J.N. (1997). Maintained all-trans retinoic acid therapy in a patient with pseudotumour cerebri despite aggravated symptoms. Leuk Lymphoma 27, 373-374. Diverio, D., Riccioni, R., Mandelli, F., and Lo Coco, F. (1995). The PML/RAR alpha fusion gene in the diagnosis and monitoring of acute promyelocytic leukemia. Haematologica 80, 155-160. Elliott, S., Taylor, K., White, S., Rodwell, R., Marlton, P., Meagher, D., Wiley, J., Taylor, D., Wright, S., and Timms, P. (1992). Proof of differentiative mode of action of all-trans retinoic acid in acute promyelocytic leukemia using X-linked clonal analysis. Blood 79, 1916-1919. Fraunfelder, F.W., Fraunfelder, F.T., and Corbett, J.J. (2004). Isotretinoin-associated intracranial hypertension. Ophthalmology 111, 1248-1250. Gerber, A., Raab, A.P., and Sobel, A.E. (1954). Vitamin A poisoning in adults; with description of a case. Am J Med 16, 729-745. Guirgis, M.F., and Lueder, G.T. (2003). Intracranial hypertension secondary to all-trans retinoic acid treatment for leukemia: diagnosis and management. J AAPOS 7, 432-434. Huang, M.E., Ye, Y.C., Chen, S.R., Chai, J.R., Lu, J.X., Zhoa, L., Gu, L.J., and Wang, Z.Y. (1988). Use of all-trans retinoic acid in the treatment of acute promyelocytic leukemia. Blood 72, 567-572. Libien, J., and Blaner, W.S. (2007). Retinol and retinol-binding protein in cerebrospinal fluid: can vitamin A take the "idiopathic" out of idiopathic intracranial hypertension? J Neuroophthalmol 27, 253-257. Machner, B., Neppert, B., Paulsen, M., Hofmann, C., Sander, T., and Helmchen, C. (2008). Pseudotumor cerebri as a reversible side effect of all-trans retinoic acid treatment in acute promyelocytic leukaemia. Eur J Neurol 15, e68-69. Mahmoud, H.H., Hurwitz, C.A., Roberts, W.M., Santana, V.M., Ribeiro, R.C., and Krance, R.A. (1993). Tretinoin toxicity in children with acute promyelocytic leukaemia. Lancet 342, 1394-1395. Naderi, S., Nukala, S., Marruenda, F., Kudarvalli, P., and Koduri, P.R. (1999). Pseudotumour cerebri in acute promyelocytic leukemia: improvement despite continued ATRA therapy. Ann Hematol 78, 333-334. Ortega, J.J., Madero, L., Martin, G., Verdeguer, A., Garcia, P., Parody, R., Fuster, J., Molines, A., Novo, A., Deben, G., et al. (2005). Treatment with all-trans retinoic acid and anthracycline monochemotherapy for children with acute promyelocytic leukemia: a multicenter study by the PETHEMA Group. J Clin Oncol 23, 7632-7640. Ribeiro, R. (2006). Update on the management of pediatric acute promyelocytic leukemia. Clin Adv Hematol Oncol 4, 263-265. Roytman, M., Frumkin, A., and Bohn, T.G. (1988). Pseudotumor cerebri caused by isotretinoin. Cutis 42, 399-400. Sanz, M.A., Grimwade, D., Tallman, M.S., Lowenberg, B., Fenaux, P., Estey, E.H., Naoe, T., Lengfelder, E., Buchner, T., Dohner, H., et al. (2009). Management of acute promyelocytic leukemia: recommendations from an expert panel on behalf of the European LeukemiaNet. Blood 113, 1875-1891. Selleri, C., Pane, F., Notaro, R., Catalano, L., Santoro, L.E., Luciano, L., Frigeri, F., Salvatore, F., and Rotoli, B. (1996). All-trans-retinoic acid (ATRA) responsive skin relapses of acute promyelocytic leukaemia followed by ATRA-induced pseudotumour cerebri. Br J Haematol 92, 937-940. Tabassi, A., Salmasi, A.H., and Jalali, M. (2005). Serum and CSF vitamin A concentrations in idiopathic intracranial hypertension. Neurology 64, 1893-1896. Testi, A.M., Biondi, A., Lo Coco, F., Moleti, M.L., Giona, F., Vignetti, M., Menna, G., Locatelli, F., Pession, A., Barisone, E., et al. (2005). GIMEMA-AIEOPAIDA protocol for the treatment of newly diagnosed acute promyelocytic leukemia (APL) in children. Blood 106, 447-453. Visani, G., Bontempo, G., Manfroi, S., Pazzaglia, A., D'Alessandro, R., and Tura, S. (1996a). All-trans-retinoic acid and pseudotumor cerebri in a young adult with acute promyelocytic leukemia: a possible disease association. Haematologica 81, 152-154. Visani, G., Tosi, P., Ottaviani, E., Zaccaria, A., Baccini, C., Manfroi, S., Pastano, R., Remiddi, C., Morelli, A., Molinari, A.L., et al.(1996b). All-trans retinoic acid and in vitro cytokine production by acute promyelocytic leukemia cells. Eur J Haematol 57, 301-306. Warner, J.E., Larson, A.J., Bhosale, P., Digre, K.B., Henley, C., Alder, S.C., Katz, B.J., and Bernstein, P.S. (2007). Retinol-binding protein and retinol analysis in cerebrospinal fluid and serum of patients with and without idiopathic intracranial hypertension. J Neuroophthalmol 27, 258-262. Yeh, Y.C., Tang, H.F., and Fang, I.M. (2006). Pseudotumor cerebri caused by all-trans-retinoic acid treatment for acute promyelocytic leukemia. Jpn J Ophthalmol 50, 295-296.